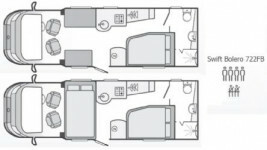 Swift Bolero 722 FB features a rear ‘French’ style bed with a full washroom and integrated shower behind. The mid kitchen is provided with a full cooker with dual fuel hob, microwave, large fridge with separate freezer. There is a Tv Aerial, drop fit carpets, Alde heating, Thetford cassette toilet, door fly screen, 2 x Tv points, 6 x 240v sockets & 2 x 12v sockets. External features include Fiamma F45s awning, reversing camera incorporated into the mirror. Cab Air Con, electric mirrors, front & side window blinds, 2 x 12v sockets, central locking & cruise control.